Last week was a big one for the Shark. I was so confident with my Fanduel picks I entered the same exact lineup in two different leagues. I promised I would be better, and like Mario Chalmers in the 2008 National Championship, I rose to the occasion. JR the Shark finished 2nd in one league, and 3rd in the other league. Two top three finishes… This is unheard of! (See results below.) In the spirit of March Madness, I am getting hot at the right time. Not only were the Sharks lineups money last week, but so were the individual player predictions. Frank Kaminsky my projected Scrub of the Week scored 29.5 Fanduel points. I projected around 30 points, which was spot on. Not that he was awful, but at his price of $10,600 he was well under his value and under his season average, which made him a scrub. 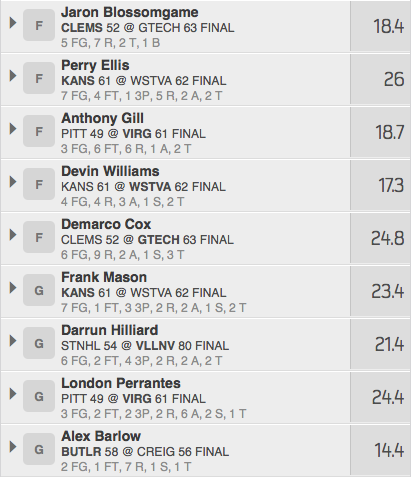 Additionally, the Maryland backcourt of Wells and Trimble went off both eclipsing 30 Fanduel points. Tonight there will be one question… Who will step up? With four of the major conference tournaments involved in tonights Fanduel, each of the eight teams will be looking for an unsung hero. When looking at the prices of each player, the leaders are priced very high this week and the role players are much lower. I have incorporated a mix of the two. Hopefully, my role players will rise. SUPER HOT FIRE. As of late Niang has been EN FUEGO. He has had 30+ points in his last four games and has been the key to the Cyclones success. I am riding this wave, no question. The guy is consistent what else can I say. He gets the minutes and has been solid all year. I also could not take Niang without his partner in crime McKay. With the injury to Perry Ellis and the release of Cliff Alexander I expect both of Iowa States big men to have big nights. I think RHJ is the key to Arizona’s success. When he performs, the team succeeds. In a big game with a big stage, the big man will show up. Expect 2+ blocks from this guy and some clutch points in the paint down the stretch of this game. I stayed away from this guy during the regular season as Xavier has a Socialist mentality when distributing minutes, but the guy has been great as of late and I think his rebounding will be important for a victory. Brooks is one of the players that will need to step up big time if Oregon wants to take the title. He has seen an increased role as the season has progressed. Tonight he will have to shine. This game will be high scoring and Ennis is one of the go to guys on this squad. He is another one of those players that needs to step up and I am counting on it. The UNC big men are banged up. Paige is the emotional leader of this team. I truly believe the upper class-man will go off tonight for the Heels. I needed to take someone inexpensive to stay under the salary cap. Vasturia gets 30+ minutes a night, but the Fanduel points have not been there. If Jerian Grant gets the defenses focus, I could see this guy having a solid night. *Steal of the night. 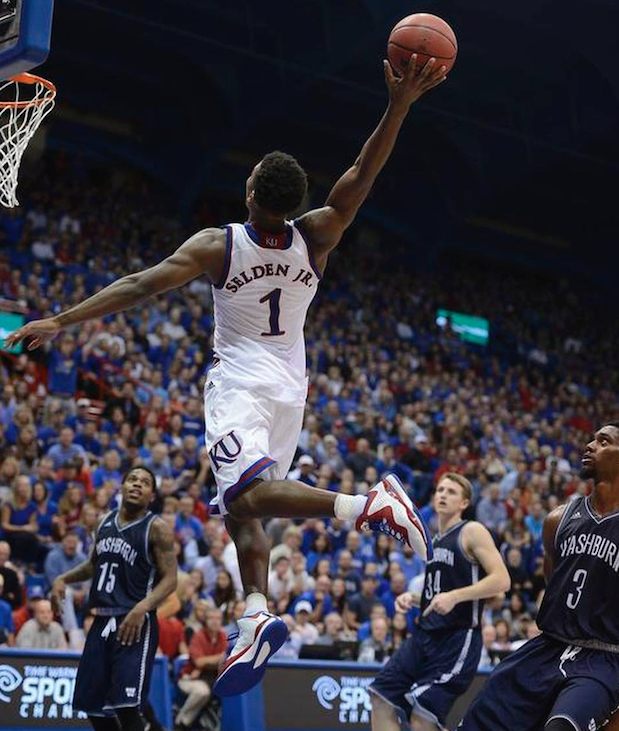 Wayne Selden Jr. He has been hit or miss all year. I have seen this guy go 0 for 7, and I have seen him drop 20 points. Unlike Burger King you never know what you’re going to get. Tonight you will get a warrior. This game will come down to the end and Jr. will have a large role. The scrub of the night will be Perry Ellis. Ellis has recently returned from a knee injury. Kansas needs him if they want to win the Big-12 tournament, but he has seen a reduction in minutes since he has returned. He is clearly not 100% healthy and I think he will have a hard time battling in the trenches when he has to deal with Iowa Staes duo of Niang and McKay. Although all season he has been Mr. Reliable, and a stud. Tonight, he will be a scrub. With the regular season coming to a close and conference tournaments starting, this will be my last NCAA basketball regular season line up. BUT do not fret, the Shark will be locking in tournament predictions as well as foolproof Fanduel lineups for tournament week as well as the big dance, which is just TWO WEEKS AWAY. SB Nation did a great piece on conference tournaments including contenders, favorites, and implications. I highly recommend taking a look when managing your lineups over the next two weeks (click below). Just two years ago we saw Florida State come out of no where and shock the ACC with a tournament win and an automatic bid to the NCAA tournament. With higher takes on the line, teams and consequently players can elevate their games or fold under the pressure. The Big Guns- When wins are a must, teams begin to cater their game plans to shut down players. Be aware that some of the big players may not perform because of this. Others who will go further in the tourney will rise against adversity and continue their dominant performances. Ride the Momentum- As March Madness approaches, momentum is one of the most important factors when analyzing teams and players. Ask yourself, who’s hot and who’s not? Look at Kemba Walker, Peyton Siva, etc. These guys got hot at the right time and continued their momentum through the end of the tournament. This is very typical of players as the season comes to a close. Look for what they have done lately. Hold EM’, Fold EM’- Associated with “The Big Guns”, look out for wide gaps in performances. In crunch-time the difference between big games and lower scoring games will be greater. 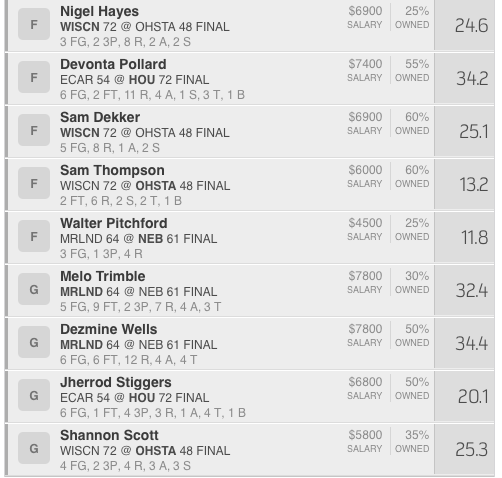 Look for some guys to have very high Fanduel points and other guys to have very low scoring nights. I love this upper classman heavy Wisconsin team. Associated with some of the points above, I think the Badgers will need someone other than Kaminsky to step up in this one. Hayes has been consistent all year and is great in big games. Tonight is his night. Always gets his minutes barring he can stay out of foul trouble. In a virtually meaningless game, someone needs to score. The junior is a massive presence in the paint and can be a rebounding machine. Plus, it doesn’t hurt that he has had three big performances in a row. A great leader on this Wisconsin team, Dekker is just as consistent as Hayes. I couldn’t decide between the two so I went with both. 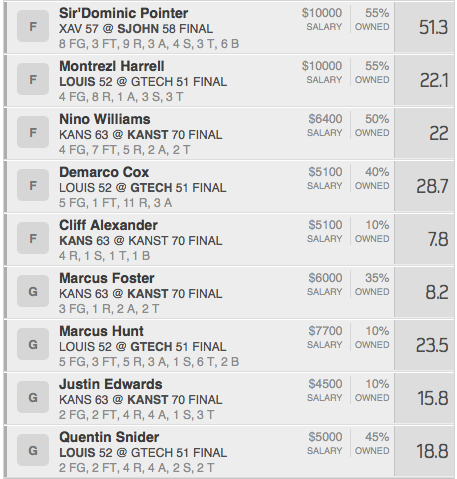 These guys will drop their usual 20+ Fanduel points and if Kaminsky is shut down it will be more. Though he is not the most consistent performer, the guy has eclipsed 36 min in his last six games. He is Ohio States number one forward. That plus the minutes is enough for me. Trimble and Wells are arguably the best backcourt in college basketball. I truly felt like I couldn’t take one without the other. I went with both knowing they will both do well, and one will do great. Just a hustler. I watched this guy’s last three games and he dropped 40+ Fanduel points in his last two of three. He plays both ends of the floor with steaming hot passion. I love this guy, and would want him on my squad any day of the week. I really like Houston at home in this one. I combined Stiggers with Pollard looking for double points when Stiggers passes to Pollard. Good matchup, at home, lock it in. Took a shot with Scott tonight. Not because he reminded me of Nathan Scott of One Tree Hill but because its senior night at Ohio State and I expect this guy to step up. Though D’Angelo Russell is a stud, I think he will need to share the wealth with Scott to get a huge upset win. *Steal of the night. For his price, Walter Pitchfork is my steal of the night. He has seen an increase in minutes and is playing his best basketball as of late. At $4,500 I was able to use him to get some extra big name players and alleviate some cap space. In a tough matchup at home, I think he will score around 20 Fanduel points, which would undoubtably make him worth more than his value. I truly cannot believe I am saying this about one of my personal favorite NCAA basketball players but Frank Kaminsky will be the Scrub of the night. On the road against a gritty Ohio State team, I think they will focus their defensive energy on shutting this guy down. Though I do not think he will perform terribly, I think they will keep him around 30 Fanduel points, which is well under his average, and not worth a $10,600. Last week was a sub-par performance for the Shark. (Please see results below). As Al Pacino AKA Coach Toby D’Amato so eloquently said in the movie Any Given Sunday, “On any given Sunday you’re gonna win or you’re gonna lose. The point is – can you win or lose like a man?” Though I picked some studs they were combined with some duds. All I can do now is move forward AND personally GUARANTEE this weeks picks will be a work of art. If you have any common sense you will want to lock them in as JR the Shark always bounces back. This week I sat at my computer with every intention of locking in an NBA Fanduel. After starting my usual research and analytics I began to laugh. The NBA regular season is a complete and utter joke. It’s laughable. Mr. Charles Barkley do you have anything to say on this topic? Therefore, with conference championship weekend coming up and March Madness right around the corner, I deferred to NCAA basketball. Make a Statement With selection Sunday just two weeks away (March 15th) every game played is more important than ever. Team will be putting their fate in the hands of their most trusted “go-to” players. This week I went back to my three basic guidelines for picking players for my salary cap team, with the addition of analyzing which players are team leaders and veterans. Floor Time- Though I changed my strategy last week to adapt to the games, this week the theme is consistency. I tried to get as many players as possible playing big minutes while still staying under the salary cap. Plays a lot of minutes, consistent player, team leader. This guy is everything I am looking for this week. Additionally, look for a big performance as he is a candidate for the Wooden Award. Niang and McKay are arguable the best dynamic duo of big men in college basketball. McKay has been on fire as of late and I see him continuing this streak as Niang draws a lot of attention from opposing defenses. The duo will definitely be busy carrying the Cyclones against the highly ranked Sooners. Though Baylor has a lot of strong big men including Royce O’Neale and Jonathan Motley, Waller-Prince is the cream of the crop. He’s dropped over 30 Fanduel points in his last three games, and is a huge impact player for Baylor. In a game that lacks big men, someone needs to step up. Both of these teams are guard heavy, neither of which have a rebounder to play big in the trenches. I am trying my luck with Clifford as he leads the big ben on Boston College in minutes. A big presence in the beginning of the season, Motley has struggles as of late. I needed an inexpensive player to stay under the cap and Motley has the most potential of these players. Hopefully, he gets the minutes he has seen in the past. This will be a low scoring game. Syracuse plays a great zone defense and Brogdon is leading the team in shooting since the absence of Justin Anderson. He is clearly the offensive threat on this Virginia team that is trying to lock up a one seed in the tournament. Although Buddy Hield is seen as the go-to guy on the Sooners, Cousins is pretty identical when looking at Fanduel points. with a $1,100 differential between Hield and Cousins, I will take Cousins any day of the week. The redshirt-junior is Tech’s most consistent guard in my opinion. This one was tough to analyze, but I went with my gut on this one. *Steal of the night. As a Longhorn fan, I love Taylor this week. 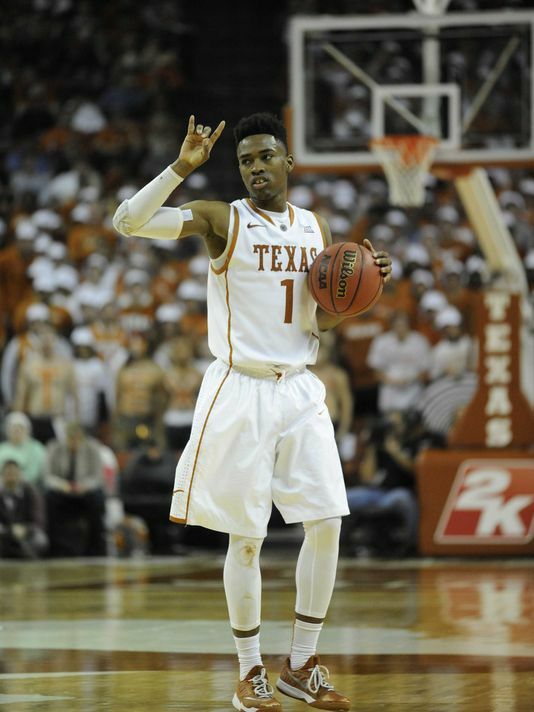 Texas is ice-cold as of late and if they want any chance at getting into the big dance they will need a win at home against Baylor. Taylor is their best player since the return of Jonathan Holmes who has been terrible. Taylor WILL have a big night. Hook ’em Horns. This week please avoid any player on Syracuse, especially Rakeem Christmas. Christmas is the most expensive player Monday night at $10,100. Virginia is probably the best defense in the country and needs a win to lock up a one seed in the tournament. They WILL contain Christmas, he is not worth his price this week. After scoring a total of 188.5 points, the Shark was only 12.8 points back from the winner who scored 201.6 points. This shows that one player in the lineup CAN and WILL make a difference. Last week I outlined the strategy I typically utilize when locking in my salary cap lineup. I have followed these guidelines for years and have been successful. For one night, and one night only I will be straying from my strategy. Here is why… Life Lesson: Sometimes things do not work out as planned. Monday night is one of these times. Lack of Games- Unfortunately, Monday there are only three major games to select players from. When selecting my players I had to do the best I could to abide by the three standards I hold my players to. When there are few games there is a large gap between expensive players and inexpensive players to choose from. This is because there are few players to choose from as a whole. Poor Matchup’s- The spread and over/under’s for all three games are both low. This means there is a lack of information to determine which players will score the highest. (See below). Split Playing Time- Players from the six teams playing Monday night split playing time, and very few players average above 30 minutes, which is typically one of the most important factors when I choose a lineup. But hey, this is the luck of the draw. To counter these difficult guidelines I had to adjust the way I picked players. Rags to Riches- To counter the high and low player prices I had to pick a few very expensive players that are guaranteed to perform, and a few very inexpensive players that are hit or miss. I typically preach consistency but this was simply an impossibility for Monday because of the lack of players. Promises- I did the best I could to abide by my rules this week given the circumstances. One word, BEAST. Pointer is one of the highest performing forwards in the game, and at $10,000 he better be. The Johnnies are a bubble tournament team. This is a must win Monday at home. Look for pointer to go off. I predict a double-double and one of his best performances of the season. Harrell is the new focal point of the Cardinals offense with the absence of Chris Jones. The last two weeks they have been feeding this guy like Joey Chestnut the hotdog eating champion. Additionally he is a rebounding machine that plays big minutes. He is one of the few players in this weeks lineup that was reasonably priced and plays big minutes. Kansas State is in dire need of someone to step up in a big rivalry game. I expect Nino to play big minutes and compete like a warrior down low. Another guy that plays reasonable minutes for his price. Cox is not the most prolific scorer so the best chance he has at a big performance is grabbing a bunch of rebounds. I took a shot here with big Cliff. Alexander was a top five recruit in the country. Thus far he has not lived up to his hype. He does not play a ton of minutes but it was noted last week that Bill Self wants to get him more involved. If the Wildcats want a win, Foster must play well. He hasn’t lived up to expectations since coming back from his suspension, which is why he is priced so low. There is no better way to motivate a player than a home rivalry game. If he is going to get back on track, Monday is the night. Tech’s guard Chris Bolden has been suspended for the remainder of the season. This means one thing… more touches for Hunt. Tonight I think Hunt will have his biggest performance of the season. I love this guy at home Monday, I can’t stress that enough. Edwards is another guy I had to take a shot on in order to stay under the salary cap. He is an extremely solid 6th man that gets decent minutes. He is completely hit or miss. *Steal of the night. 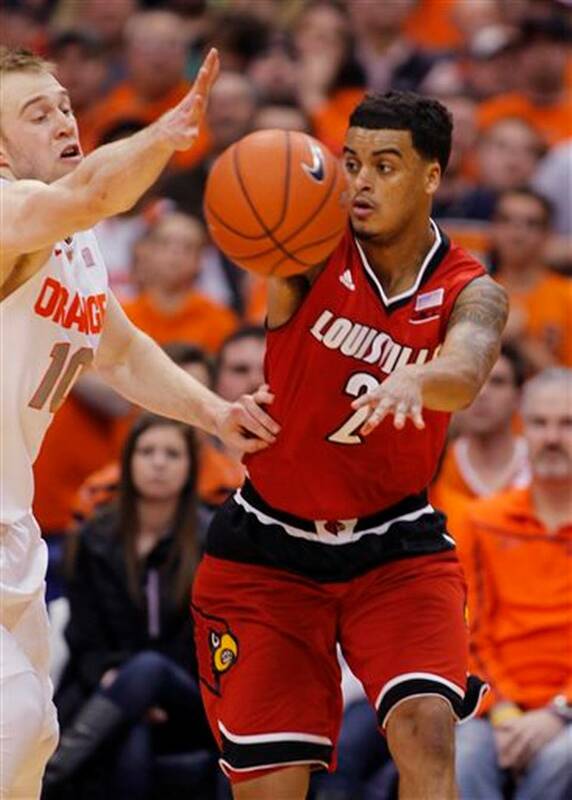 As of last week, Louisville’s leading scorer Chris Jones has been dismissed from the team. This puts Quentin Snider in line to be a starter for the Cardinals. In his first start after Jones’s dismissal, the freshman played 38 minutes. If his new role continues Snider could be a great lineup addition going forward. AND THE FIRST PICK IS…. Although I am a football guy at heart, I am proud to say that I have started my NCAAB career 1-0 two weeks ago. If you don’t believe me look below for the proof and the winning team. Going forward, my picks will be based on the website Fanduel.com opposed to DraftKings.com. I love the simplicity of the site and have been a loyal user for years. If anyone reading is new to salary cap fantasy sports, I highly recommend watching the HBO Real Sports with @BryantGumbel segment on Fanduel. Please find clip below. How It’s Done There are a few things I value when locking in my picks. As seen in @RealSportsHBO some people go above and beyond and over analyze. JR the Shark (me) on the other hand mainly factors in three things. 1. Matchup’s– I look at the spreads and over/unders for the games involved in the days picks. 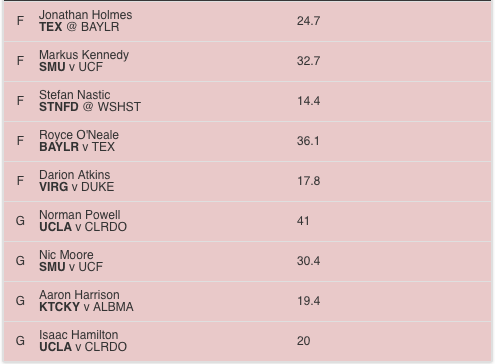 Yahoo Odds gives a variety of projections so I like to utilize this site (http://sports.yahoo.com/ncaa/basketball/odds/). If a game is projected to be high scoring and one team is favored by a lot of points I tend to roll with players from that team. 2. Minutes Played– (Applicable to Basketball/Hockey) If a player is constantly on the field or the ice, they have a better opportunity to put up numbers. Think about it who will score more a player riding the bench or a player who is grinding for 30+ minutes. Since I will be giving NCAA Basketball picks today. I will give extra insight… I love players who play 30+ minutes if I am spending $7000+ in salary cap I expect these minutes. If I am spending $7000- I settle for the mid to hight 20’s in minutes played. 3. Consistency– I like to examine the five or six most recent games played. To be eligible for earnings I have calculated each player on your team must earn roughly 25+ Fanduel points. Obviously this varies on the night, but more often than not I find this to be true. Has the player been scoring this many points as of late? It is important not to be decieved by the given averages. You MUST look into individual games. I once saw Fanduel give a player an average of 28 points. After looking more in depth this was because he scored 42 in one game then went on to score 3 and 11 in the next two. Consistency is of utmost importance! *The star indicates my steal of the night. With the injury to Guard Justin Anderson, I see London Perrantes getting some and potentially most of Anderson’s touches. Look for Perrantes to drop 3-4 three pointers as someone needs to fill sharpshooter Anderson’s shoes.